September's was a good one too. Filled with Maya Road chipboard polaroid pieces, My Mind's Eye chalkboard paper, cream thickers & gold Studio Calico stars amongst other things. I have a few layouts to share this month and one mini-album that I'll be sharing over the next few days. 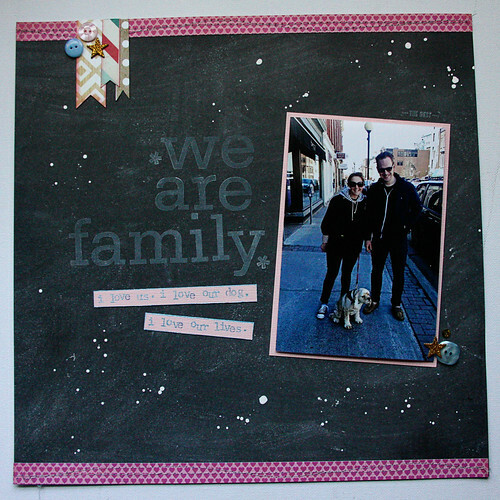 This one uses the chalkboard paper and I love it. I used the new Hero Arts unicorn (white) ink and a very old set of alpha stamps to create the title. I did a little sewing on the top and bottom of this one to attach my pieces of the pink heart pattern paper. A few little flags and some buttons & stars at the top for a little something something. For this layout I used the tags from the 12 by 12 piece of paper to create a background, then matted my 4 photos onto the pink cardstock. I also added a little embellishment cluster using the polaroid chipboard a button and a word cut out from the same 12 by 12 pattern paper as the tags. I love those big sheets that you can cut apart and use for embellishments. For this layout I wanted to do soemthing a little more monocromatic so I stuck with the krafts and neutrals and added little bits of blue picked up from the water in the picture and a tiny bit of green for good measure. This layout is very simple. 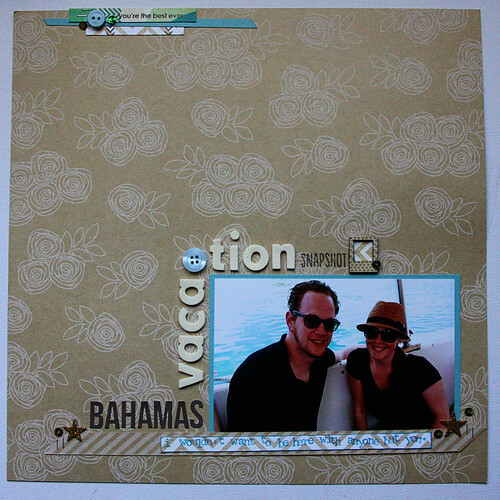 I wanted to try something a little different for my title, angling it around the corner of my picture and added the little 'snapshot' stamp and polaroid chipboard to balance it with the 'Bahamas' on the other side. 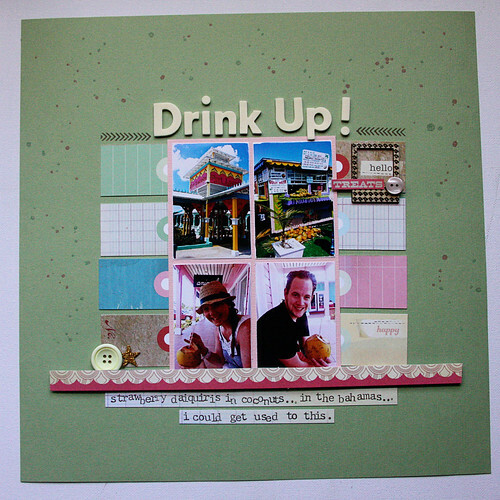 I also added some sequins in this page here and there which was a delightful little surprise in this month's kit! This month's kit was a great one. I'll be back to share my other layouts tomorrow and I have a mini album I'll be sharing soon too!